Create slideshows/scrapbooks with live Web content. Is there a better alternative to QuikShow? Is QuikShow really the best app in Author Tools category? Will QuikShow work good on macOS 10.13.4? 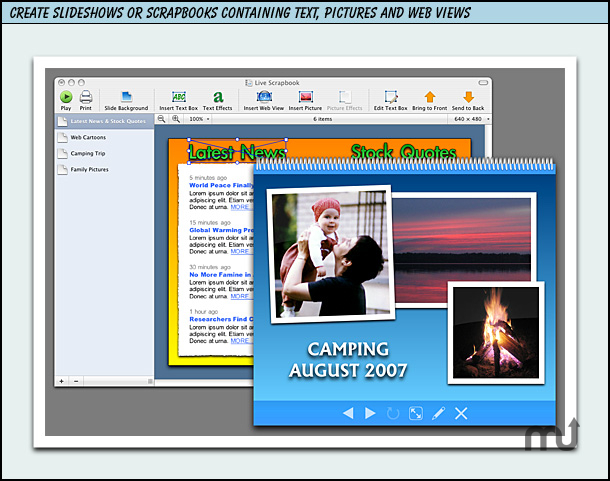 QuikShow... Quickly create slideshows or scrapbooks with live Web content and fancy visual effects. QuikShow lets you create slides containing text, pictures and even portions of a Web page. Importing Web content is easy: enter the address of a Web page, drag the mouse over the area you wish to import and youÕre done. Every time you play a slideshow, Web content will be refreshed automatically. QuikShow also gives you easy access to many visual effects and supports a variety of file formats for saving your work. QuikShow comes with a free player application. QuikShow needs a review. Be the first to review this app and get the discussion started! QuikShow needs a rating. Be the first to rate this app and get the discussion started!